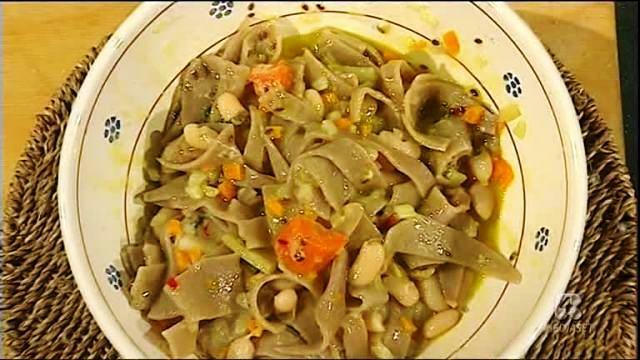 Ingredients: cannellini beans from Atina PDO maltagliati grains, olive oil, celery, carrot, onion, fresh chilli, pecorino Picinisco PDO, salt, flax seeds and sage. Preparation: In a pot with cold water, bring to boil the beans with celery, carrot, onion and salt at the end of cooking. Make a sauce with olive oil, celery, carrot and onion and a second fry crushed garlic, red pepper, sage and flaxseed. Add the beans from Atina at first fried, cut into strips and put the whole wheat pasta in boiling salted water. Drained the pasta is celebrated the marriage uniting in a large bowl the first fried with beans, pasta, sprinkle with cheese sauce and the second ...... good appetite. First of all put to cook the beans with cold water in a pot with celery, carrot and onion, best if the pot is large diameter. Prepare separate a mixture of lard Black, garlic and chili. Saute the chopped oil, always in a large frying pan, being careful not to burn it. Cook for five minutes, the hand-made pasta, made with only flour and water. Pour into the pan of fried beans cooked flavor and start adding plenty of parsley along with the beat. Finally, add the pasta with a little 'cooking water from the beans and leave to stand for 2 minutes. Let it sit in the crock bowl before serving because the dish must appear rather dry. SAGNE and Cannellini beans ATINA PDO "Pappafuocchie"
Ingredients: cannellini beans from Atina DOP extra virgin olive oil , flour, water, salt, garlic , onion, celery , tomato sauce, chili. Cook the beans in plenty of cold water , low heat for about 1 hour by boiling . Add a clove of garlic , celery , and salt just cooked. Season the beans with a sauce made with sauteed onion , garlic, celery , tomato sauce and chili. Mix the flour ( also integral if you want ) with little water and make a dough tough . Knead vigorously incorporating , if necessary, more flour . Roll out the dough into a round sheet is not fine . Allow it to dry , sprinkle with flour and roll . With a sharp knife cut it across to get the so-called " maltagliati ." When you are done let them hop around between your hands so that they open . Cook in boiling salted water, drain it but not too much when , after taking a boil, will be coming to the surface. Putting it all together and serve in a bowl of baked clay. Ingredients: Atina cannellini beans, flour, water, salt, extra virgin olive oil, garlic, chili. Mix the flour (also integral if you want) with little water and make a stiff dough. Knead vigorously incorporating, if necessary, more flour. Roll out the dough into a round sheet is not fine. Allow it to dry, sprinkle with flour and roll. With a sharp knife cut it across in an irregular manner. When you are done let them hop around between your hands so that they open. Allow to stand and slowly fry the garlic in hot oil. In the meantime, put a saucepan with salted water to the boil add the "faffocchi" and drain, but not too much, when, after taking a boil, will be coming to the surface, add the beans, garlic and sfritto, to taste, chili. Serve hot, preferably earthenware pans. IIngredients: Atina cannellini beans, olive oil, garlic, parsley, pepper, salt. Cook the beans in plenty of cold water, low heat for about an hour by boiling. Drizzle with extra virgin olive oil, add chopped garlic and parsley to taste and chili. Dish is great hot or cold. Cook the mushrooms cut into strips with garlic, oil and salt. Add the sautéed mushrooms well cooked beans and stir for a few minutes over high heat. By ditaloni cook for about 3/4 of cooking, carefully remove from the pan ditaloni the dough with a wooden spoon and gradually add to the mixture of mushrooms and beans. This will make the sauce does not dry out and, at the same time to bring together the starch of the pasta taste that unleashes a load more. When cooked, serve with pepper and chili. Half of Costa celery , 1 carrot , 2 large onions , 1 bunch of Wild Fennel , extra virgin olive oil 50-60 mlSalt, pepper, black pepper, dark Tripe : 500 gr. (you can substitute with white ) , puree tomatoes: 150 gr , Cannellini Beans Atina Dop : 250 gr. dried , grated Pecorino Picinisco seasoned to taste. Make a coarse chopped celery, carrots, fennel and onion ; fry in olive oil and add pepper and chili. Throw into the pot of lightly fried tripe dark (remember that you can replace it with the white wash ) after having cut it into small pieces . Cook for about 10 minutes over high heat , stirring frequently compound . Add the salt. Proceed with the natural tomato paste and cook for about an hour. Aside simmer for an hour the beans in plenty of water without prior soaking ( the quality is very tender ) . A 3/4 of cooking tripe insert three ladles of water and powdery finish cooking the beans for the last quarter of an hour. Add the beans to the tripe and season together again for 2 minutes. Serve hot with a sprinkling of Pecorino seasoned Picinisco . 300 grams of dried beans, 1 clove of garlic, extra virgin olive oil, ½ lemon, a pinch of chili powder, 1 fennel 1 raw carrot, 1 raw onion, a pinch of salt, balsamic vinegar to taste. Puree a clove of garlic with olive oil and a pinch of salt. Add the cooked beans with a little 'cooking water by reducing everything in cream. Add the juice of half lemon and a little 'pepper. Rifrullate everything to make it even creamier. Use the mixture of raw vegetables with carrots, celery and fennel flavoring, if desired, with balsamic vinegar. Nectar broccoli greens, a quality that is called in the local dialect ciociaro mugniele, boil for a few minutes, drain and set aside. Fry in a pan with garlic, oil and pepper and add the broccoli still warm. After a few minutes of moderate fire place in the compound of Atina cannellini beans and mix thoroughly, adding occasionally a little 'cooking water from the beans. Once seasoned soup, serve with a slice of toast and a drizzle of olive oil. 300 grams of dried beans, 1 onion, 1 bay leaf, 3 stalks of celery, 1 kg of cabbage, extra virgin olive oil to taste 4 slices of stale bread, 1 pinch of pepper, 1 raw carrot, 1 pinch of salt , 1 red pepper, 100 grams of cheese dry Picinisco Boil the beans with onion, celery, carrot and bay leaf, adding a pinch of salt in the water. Chop the cabbage leaves and boil for one minute. Just drain, go over them in a pan with olive oil, salt, pepper and chili. 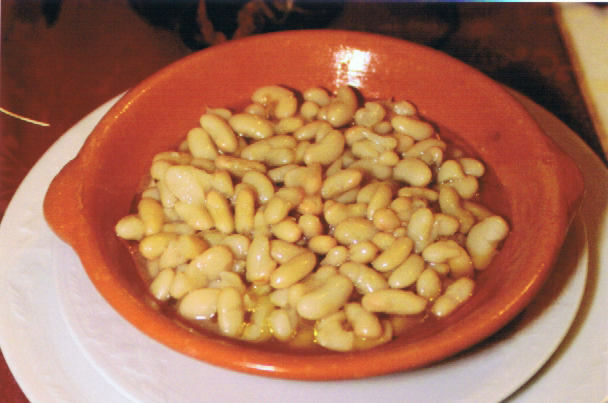 Take a terracotta bowl and place the slice of bread at the base of the same, basting with broth of beans, cannellini beans and cabbage rehearsed. Continue this process for the other three bowls to serve the soup in individual portions. Let it rest before serving at the table with the addition of grated pecorino cheese. Ingredients for 1 person: 100 gr. Cannellini of Atina, 2 medium-sized potatoes, a few leaves of cabbage, vegetable soup (celery, carrots, onion), extra virgin olive oil, 1 slice bacon, salt, onion (1-ply). Cannellini beans are cooked with water and bay leaves in the pot for 30 minutes. By cooking the potato and cabbage together, boiled in broth for 15 minutes. Prepare a pan with the bacon and a little onion. They throw the pillow Cannellini and potatoes and cook for 15 minutes over low heat. It is prepared in a bread bowl (wood stove) stale, it adds to the soup and bread do you stand for 5 minutes. Pass the beans and collect the puree into a bowl, add all other ingredients, pour into a container and let it cool for an hour circa.Quindi take the pastry and make them into small discs with shapes of ravioli. With patience put at the center of the disks in the mixture and cover with a second disc. Fry in peanut oil and serve hot with a sprinkling of powdered sugar. Mixed vegetables ( prickly lettuce , chard , broccoli, cabbage, tanneri) , 1/2 kg . of potatoes, 1/2 kg of cannellini beans , 1 garlic, 2 large + 1 small onions for garnish, 2 carrots, 1 stalk of celery, pepper , chili pepper , salt, extra virgin olive oil , 1 pig foot ( 1 carrot , 1 onion, 1 celery ) , slices of stale bread . Take a large saucepan ; make a sauce with olive oil, celery , carrots and onion , then add salt, pepper and chili. Start the mixture of soup starting with : beans , potatoes, cabbage, prickly lettuce , broccoli, chard , tarmeri , relying on knowledge of the products. Sauté the first ingredient to be added then the second and continue cooking, adding occasionally a little salty water previously placed on the heat at a constant temperature (not to lower the internal temperature of the soup ) . This first phase lasts about half an hour , so continue cooking for another hour. Cook for an hour by foot pork with celery, carrot and onion. Remove from heat and allow to cool for a few minutes . Once you caked bones and put into the soup finely chopped . Serve at the table with stale bread and a bit ' of raw onion. 1 rind for each person (measure 5x10 cm. ), Celery, Carrot, Parsley, Garlic, extra virgin olive oil, cooked cannellini beans (50 gr. Per person) Prepare the pork rinds and imbottirle with parsley, salt, celery and carrot in listelline. Roll up and tie with string every rind and then boil in cold water. When cooked, drain the pork rind and cut into small disks, set them aside. In a pan prepare garlic and olive oil and fry the beans previously cooked add chopped parsley. After 4/5 minutes in the pan put pork rinds cut and seasoned. Serve hot. 300 grams of beans from Atina ; half deciliter of oil extra- virgin olive oil; a medium-sized red onion , 3 cloves of garlic ; 3 celery ribs ; a chili ; salt and 200 grams of ripe tomatoes.Wash the beans thoroughly under running water . Form the crater with the flour and knead with enough water to get a stiff dough , knead for a long time , then form a ball and put it to rest covered with a damp cloth for at least an hour. In the meantime, we put the beans to a boil , starting of course with cold water , with a celery stalk and a clove of garlic. Boil for at least 90 minutes , slowly, slowly , in a crock pot or heavy tinned copper . Roll out the dough , not so fine with rolling pin, flour the dough and roll it up on itself , cut with a knife sideways , so you do not get the noodles , but the diamonds . In a pan with high sides to make a sauce with the oil and the ribs of celery finely chopped , with onion , cut into thin discs , the garlic cloves , peeled and finely chopped , or whole if you prefer to take them off. When you are going to throw fry the chopped chilli and tomatoes washed and passed . Let flavor and then throw the beans cooked to order now , with their little water. Turn with a wooden spoon and then throw maltagliati cooked al dente , 3-4 minutes in salted water and drained . Turn with a wooden spoon , season with salt if necessary , turn off the heat , cover, and wait at least 10 minutes before serving. Preparation : Cook the beans from Atina in plenty of cold water , low heat for about 1 hour boiling.Add a clove of garlic , some celery . When cooked, drain the water.Prepare separately a beat with lard and odors ( onion , garlic, celery and parsley) and cook it in a pan with high sides with extra virgin olive oil .Add the potatoes cut into chunks , chard , kale , leeks , zucchini , green beans and nettle already ' clean cut and stretching with water.You let it cook over medium heat for a few hours , then add some pork rinds after blanching and cut into strips .Finally, add the beans salt and continue cooking over moderate heat .When cooked, the soup should be served in earthenware bowls which were arranged slices of stale bread, previously toasted and sprinkled with freshly ground black pepper and a drizzle of extra virgin olive oil . Ingredients for 5 servings : 500 g • Rice Violone dwarf shrimps integers n ° 10 • cannellini beans from Atina DOP 200 g • celery • a ripe tomato • 80 g butter • white wine • squash blossoms n . 15 • salt and black pepper q.b. Preparation Wash and remove the head with prawns , thoroughly clean the zucchini flowers from the pistil and break them in two. Boil the beans . Prepare a vegetable broth adding the heads of the prawns. Put the rice in a pan and toast over medium heat with the wine and let it fade ; then add the broth a little at a time and half-cooked rice add the shrimp, cannellini beans and then the flowers , and cook together. Add salt according to your taste . When cooked, add butter to thicken the rice and serve. Ingredients: Flour gr. 600 , dried beans ( cannellini Atina ) 300 gr. , Oil, onion , garlic , red pepper, celery , salt.Method: Mix the flour ( also integral if you want ) and with as much water as ' necessary to obtain a dough tough . Work vigorously incorporating , if necessary, then more flour and roll out with a rolling pin until you have a circle of pastry is not fine . Allow the dough, then sprinkle with flour and roll . With a sharp knife cut with cross cuts to get the so-called " maltagliati ." When you are done let them hop around between your hands so that they open . Cook in boiling salted water and remove the dough from the fire when , after taking a boil, will ' come to light . Drain it but not too much. 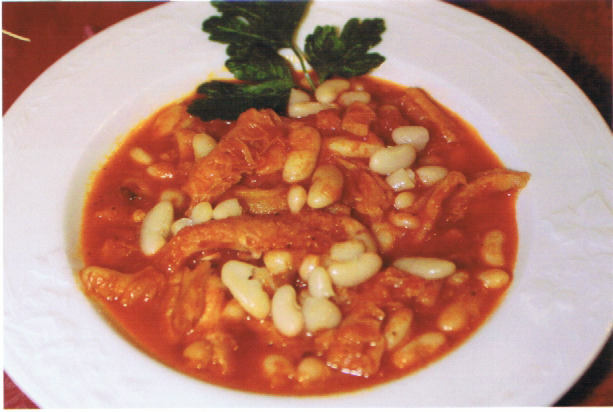 Season the beans ( cannellini Atina ), which have previously boiled , with a good sauce made ​​with sauteed onions , garlic, celery and tomato sauce and made ​​spicy with the chili . Putting it all together with the pasta and serve in a bowl of baked clay. 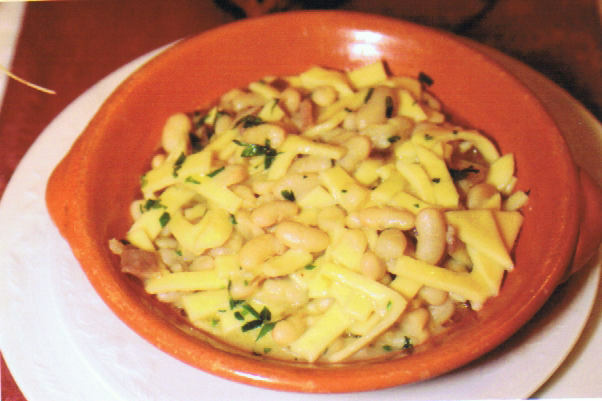 TERRINA cannellini beans ATINA OF POD AND SAUSAGE. 600g cooked cannellini beans from Atina PDO and smoothies (except two tablespoons ranging set aside ), with two eggs , white pepper , salt, and a trifle , as it was in the old recipes, nutmeg finely chopped. Two crumbled sausage , chopped 80g of bread with whole crust , a large sprig of parsley and one chopped basil , a clove of finely chopped garlic , two tablespoons of whole beans put aside , all mixed together with an egg , a little ' ev olive oil and a pinch of salt.Rectangular greased bowl , lined with greased aluminum foil well with a certain extravagance ; a layer of cream of beans , one compound with sausage , one of cream of beans. 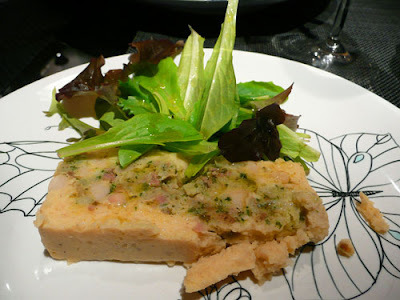 Covered with another aluminum foil , sealed all around .Oven to 200 degrees , preheated , containing a large baking sheet with pure hot water bath ; put down the bowl and leave for 45 ' .Serve warm , surrounded by a fresh salad leaf covering some dark , contrasting with the rosy cheeks of cannellini beans and sausage.Accompany her to the table with a cruet of abundant ( casseroles legumes like to be wet ) citronnette , emulsified at the moment, lemon juice , extra virgin olive oil olive oil, pink peppercorns and salt.. Ingredients: 500g bucatini, 300g of peeled tomatoes, 300g courgettes, aubergines 300g, 150g cannellini beans from Atina DOP, 1 glass of white wine, onion, basil, extavergine oil, salt to taste To brown the finely chopped onion in "oil, add the zucchini and eggplant cut into cubes, to blend with the wine. Put the tomatoes, season with salt and cook everything for 20/25 minutes, then add the beans already cooked and continue to cook for another 10/15 minutes. Boil the pasta in boiling salted water, drain and toss with sauce and basil leaves. Ingredients: 400g of flour, 300g of peeled tomatoes, 200g of cannellini beans from Atina PDO , garlic, olive oil extavergine , pork rind , chili pepper , salt to taste. Mix the flour ( also integral if you want ) and with as much water as ' necessary to obtain a dough tough . Work vigorously incorporating , if necessary, then more flour and roll out with a rolling pin until you have a circle of pastry is not fine . Allow the dough, then sprinkle with flour and roll . With a sharp knife cut with cross cuts to get the so-called " maltagliati ." When you are done let them hop around between your hands so that they open . Cook in boiling salted water and remove the dough from the fire when , after taking a boil, will ' come to light . Drain it but not too much. Cook the beans in the pot for about two hours. Sauté garlic and pepper, add the cooked beans and pork rind . Joining finally maltagliati to the beans along with a little ' cooking water . 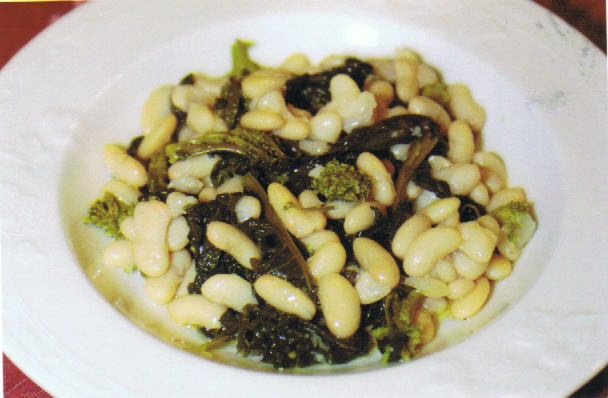 Cannellini beans from Atina , are the "protagonists " of this nutritious dish . U.S. to homemade pasta , give a recipe to be savored . Ingredients: 300 grams of beans from Atina ; half deciliter of oil extra- virgin olive oil; a medium-sized red onion ; three cloves of garlic ; three ribs of celery ; a chili ; salt and 200 grams of ripe tomatoes . Ingredients for 4 people 350 grams of cooked cannellini beans from Atina PDO 400 grams of prawn tails 3 tablespoons of extra virgin olive oil 1 tablespoon white wine vinegar 2 basil leaves some chives a few sprigs of parsley salt. Wash and dry the herbs and whisk together oil and vinegar. Join a generous pinch of salt and a tablespoon of water and blend again to obtain an emulsion. Shell the prawns, taking care to devein the intestine. Heat a pot of salted water and plunge the shrimp for about 2 minutes, then drain. Add the shrimp to the hot well of Atina cannellini beans and stir. Spread across 4 plates and pour the sauce on the wire.